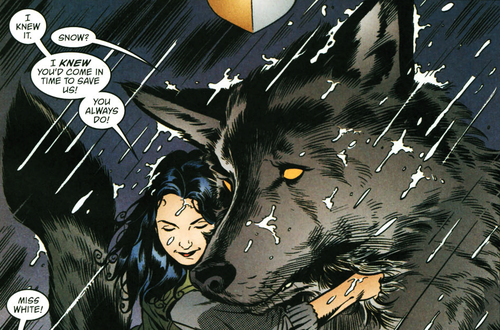 FABLES is far and away one of my favourite comic books. Since its debut in 2002, the epic and multi award-winning series has wowed fans and critics alike with its masterfully modern take on classic Fairy Tales and Folklore, rich with inventiveness, elegance, wit, emotion and action. Having passed 100 issues and now a veritable franchise replete with equally-acclaimed spin-off’s, it has become one of flagship titles of DC Comics’ Vertigo imprint. The release of a new trade paperback collection – of which there have been sixteen so far – is always a source of high anticipation for me. It was simply fantastic, therefore, to have the opportunity to speak to the series’ mastermind Bill Willingham for the latest issue of COMIC HEROES (#7), which hits the shops in the next week or so. My enjoyable chat with the very genial wordsmith lasted for well over an hour, and, as a result, I had loads of extra material that my 2000-word feature simply couldn’t hold. It’d be a shame for it not to be seen, so am placing the unexpurgated version here. Thanks to Pamela Mullin at Vertigo for setting this up. Enjoy! 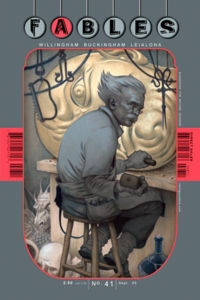 DG: It’s astounding to think that Fables is closing in on its tenth anniversary – did you ever think it would go this far? BILL WILLINGHAM: At the beginning, I was in this pattern of coming up with ideas for Vertigo comics that they would agree to do and which would get a pleasant amount of critical attention and no sales. 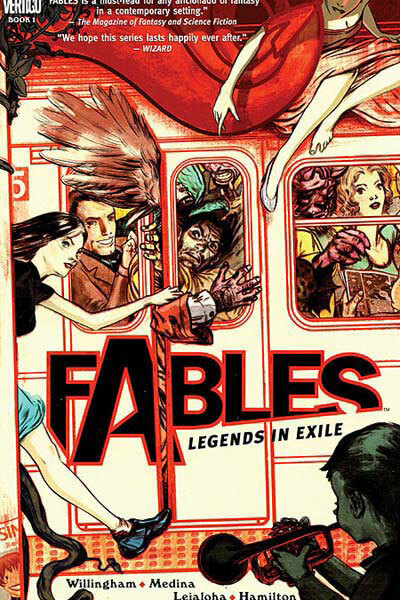 Even though I thought Fables was a stronger idea than most, I expected it to follow that pattern. If we got a full 12 issues out of it, I would have counted that as a masterstroke of success! 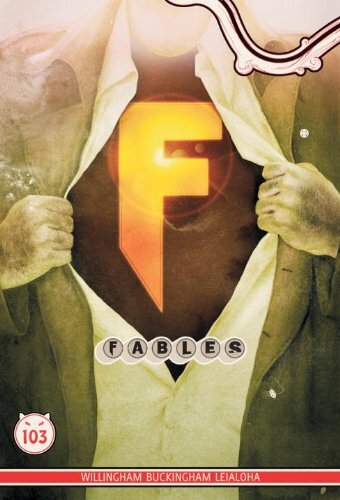 So yes, the long-term success of Fables has come as a bit of a surprise – and continues to. I am not the most trusting fellow: I keep expecting the entire readership to wake up in time and collectively realise that we have been making these stories of talking ducks and moo-cows and exclaim “ what were they thinking?”…! Instead of twelve issues, you are now pushing 160 with the core series and the Jack of Fables and Cindarella spin-off titles. 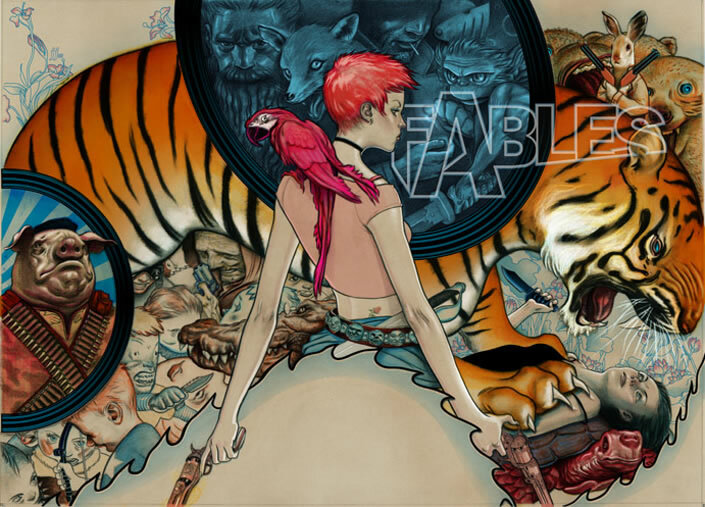 Fables seems like the natural successor to Neil Gaiman’s Sandman series – would you agree? 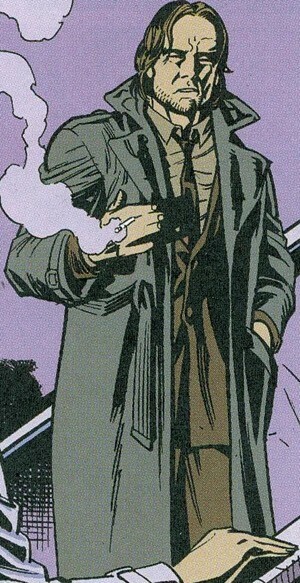 I like to put the caveat when those comparisons are made, in the sense that Sandman was certainly its own thing. I wouldn’t try to recreate it in tone or in substance with a series of my own. If Fables seems to be the anchor upon which Vertigo is moored at any given time these days, then sure! A hallmark of Fables is the incredibly intricate plotting – how much of it did you have worked out in advance? At the beginning, I think I had a couple of years worked out. You generate three or four story arcs in the proposal and you’ve got the first two years right there. When I began to see that it had legs and that the investment of care and planning might actually pay off, I think at any given time [Fables artist] Mark Buckingham – who is integral to long-term planning- and I have the next year’s worth planned, in that we know what every issue is going to be and probably the two years beyond that in broad strokes and lots more that we hope the book survives long enough to be able to do someday. Fables is similar to Alan Moore’s League of Extraordinary Gentleman in that it exposes literary archetypes to new audiences – what’s the feedback from fans? When we started Fables, what we do all along is take all of the well-known stories – Snow White, the Big Bad Wolf, Cinderella, the three Bears, all of the others that are well established in the public psyche – and use them as a carrier mechanism so I would be able to use some of the less well-known ones, the more fun and the more interesting ones. My favourites are certainly more esoteric. There have been occasions where I haven’t known who this character was and that has inspired me to go and look up those stories. I hope this continues to be true. We are not overriding the old stories, we are part of the same ongoing process. How did you develop the characters in to their various roles? Was it vital to go against expectation, as in positioning the Big Bad Wolf – a classic villain – as the hero figure? All this happened at a time when fairytale characters were coming round the bend again and, even in modern settings where I was going to tell you new stories, every character would more or less be the same character they were in the original stories. But, ff I’m going to be successful in all in this new take, it would have to be all “Oh, I would never have suspected this character to be like this!” – but I would also apply logic and so this character would more than likely end up in this position etc. And so someone like Snow White would become this authoritarian character by the time that we meet her. With Bigby Wolf – my two favourite fairytale characters of all time were the Pied Piper of Hamlin and the big bad Wolf – I figured that if I kept Bigby is a villain, then I would only be able to use him two or three times because I hate the idea of the recurring villain. Then, it becomes the story of a completely impotent protagonist. You know, if the Joker can’t be stopped and will always come back than Batman cannot truly work so I didn’t want that. But I wanted to use the Big Bad Wolf wrote long time. I figured that I could come up with a reasonable idea for how Bigby could have become reformed. One of those being, of course, that he met the woman for him. I joined a church once because my girlfriend of the time was into all that so I can see that as a pretty effective motivating factor for reform. An early treat was seeing Snow and Bigby get together – how confident were you that they’d make a good couple? Initially it came as a dare: what is the most improbable thing that I can do? Most of Fables is asking those kinds of questions. Every one of those questions get answered in a way that makes a good story. With Snow and Bigby it’s like: he’s a wolf and she is a fairytale princess who keeps getting her heart broken by anyone she cares about. The likelihood of them getting together is pretty low so let’s see if we can make it happen! It’s an irresistible challenge. The series rewards long-term readers as all the characters eventually get their moment in the spotlight: is there anyone who you have big plans for? There are recurring characters we have plans for. The question would have been yes a few years ago when I finally came up with a good story for the Pied Piper, my other big favourite. This ended up being Peter and Max, the Fables novel. So, I have been checking a lot of those off the list. However, there are new characters like Bigby’s cubs-they’re the ones that we have these wonderful extended plans for. You certainly play the long-game: Frau Totenkinder was the dark horse of the series for 90-odd issues! Yup, she got quite a moment in the spotlight when she finally did! That was simply a case of her growing on me as a character. I didn’t think she would be as important as she became. However the coolness factor as well as that there are more interesting things here than you might have suspected, she certainly earned her moment in the sun. A big part of that is down to Bucky: he said early on that I should not kill off Flycatcher because he’s a real favourite. That had a big effect, because I would have just gone ahead and done it if he had not brought up! He said don’t kill him and I clearly wanted to. So it was just a process of what is the most evil stuff that I can do to him instead of killing him but then get a good story out of it. More interesting than a tragic character is this hapless, innocent character who turns out to have a noble and solid force within him. And I love doing that: Boy Blue was going to be nothing more than an office clerk that he developed into a surprising character arc. Such things are not planned from the beginning, they simply evolved from them being in the right place. Yet, you’re not afraid to consign major characters to dark fates, like Prince Charming and Boy Blue – would you ever declare the likes of Bigby expendable? One of the rules that we made when I got into this was that no one is safe so the long-term answer is yes. Like anyone else in the series, like Flycatcher – even though Bucky would be saddened by this – they can potentially go. That said: I don’t think I have any base plans at the moment to do so. I think the story wherein that actually happened would have to be pretty awesome. Superhero comics notoriously subscribe to the idea of death being reversible, do you subscribe to that with Fables’ characters? Sort of yes and no. My reflective answer would be that the whole superhero thing of “no one’s ever really dead” undercuts the power of the stories. Generally I think dead would be dead. Of course, you’re dealing with a cosmology that is already ready-made where that is not the case, where there is such a thing as an afterlife and things like that. So I suppose there is a process of negotiation. Okay, so I want this story to mean something, let’s say that I want to remain adamant that Boy Blue is dead so that his death story continues to have its power, then there needs to be something that expresses that these people do believe in an active afterlife. There are stories where you actually go to Hell and meet the Devil. So they know those places exist and that is why you get the occasional mentions. But mostly dead is dead. We’ve thought of a story that may come up sometime soon where we may use the ghost of Bluebeard and Shere Kahn for. So yes we will bring characters back as ghosts for a while because we can get a good story out of it but the rule generally is dead is dead-with some restrictions. It’s routinely alluded to that Fables have a measure of their power by just how beloved their stories are – will you ever divulge the true nature of their power? Well, I want to! I think it works well as a mysterious thing right now. One of the things I hate in stories is a massive information dump that occurs in fantasy and science fiction which explains how the world works. I have hopefully been pretty careful about avoiding that. At the same time, I think it’s important that I know what the answers to the questions are. Unless that there’s someone who shows that this is how it definitively works, people will interpret it in various ways. If we ever bring it to an end, I hope that all of the big questions will be answered. And they should do! That comes early on in the things that have shown up in my writing. I like to do stories about bureaucracy. I mean, if any of this stuff existed – i.e. magic and miracles and wonders – it would be part of the same mundane nature of our everyday lives. There would be rules, red tape, all of that. For some reason, that idea is endlessly interesting. I have a story kicking around that I may actually write someday: what happens in heaven when a “Certificate of Damnation” goes missing? Anyone who finds it can just fill in any name that they want and it’s like “okay you’re damned now!”. Just that kind of bureaucracy of missing paperwork – but in fantastical situations. Presumably, you chose New York as the location for Fabletown because of the cosmopolitan nature of the city and of its 17th century incarnation as “New Amsterdam”, but were you ever tempted to place Fabletown in Los Angeles? I considered a lot of places. I was living in a small town in Vermont and I didn’t think it would appeal occurring in a small town location. I was familiar enough with New York, but not at all with Los Angeles. I visited there a few times and I got lost every time. Hopelessly lost! I was thinking of setting it in Philadelphia, because there was a big urban environment that I was fairly familiar with. However, I finally chose New York two reasons: one was that Fables’ editor Shelly Bond lived there so if location scouting was needed, she could. And she volunteered it! The other is that New York is always going to be the official city that represents coming to a new world. Of Ellis Island etc. You know, people from all over the place flooded in to become Americans and they came to New York. It’s not the case any more but historically it was the case. It was the centre of that. There’s a clear metaphor of Fabletown being very much like Israel – how much of this informs your stories? Yeah that was in issue 75 with the mission where Bigby does give the big Israel analogy beforehand. On one level, I am perplexed: there were some definite pushback from some readers who are not of a pro-Israel stance, who said it’s a very nuanced situation and you don’t know what you’re talking about things like that and that it’s ridiculous to make that comparison. My perplexity was that I was giving Bigby an analogy to use so someone who had not heard of it could have understood. Whether or not you are pro-or anti-Israel, you would have got it. It worked for the story purposes. On the other hand, I think it is an apt analogy: Israel still does exist today, partly from outside help but mostly because they are stiff-necked bastards who are simply not going to roll over so the world will think nice of them. I admire this. My mother was pro-Israel for her entire life and I think managed to pass that along strictly by virtue of the notion of rooting for the underdog and an admiration for their tenacity and I think that shines through in Bigby’s perspective. A key mystery of the first years of the series was the identity of The Adversary – how did you arrive at your ultimate choice? [SPOILERS!] It’s probably well-known that my first choice for The Adversary was going to be Peter Pan. The reason for this was that Peter Pan in the original tale – or rather the Disney tale that every kid grows up with – scared me! This was because he was supposed to be the good guy and yet the whole premise of this story is that he comes to your house in the middle of the night and steals you away from your parents! At that point in my life, being kidnapped from parents was amongst the greatest fears that I had. So, when we saw that version in the theatres, I could not understand how people thought that this was a great story – I was like, “No! This guy is a monster! A Villain!” – and this stuck with me for many years! 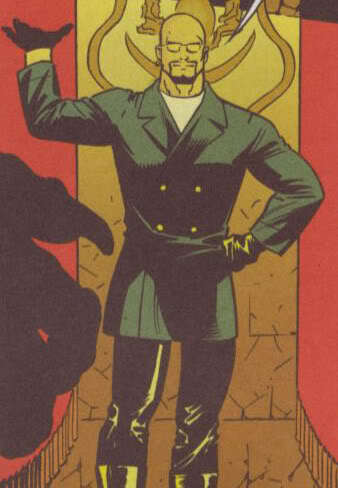 So, when I did Fables, I really wanted him as the Dun-Dun-DAH! Surprise Villain. However, the situation in England with The Great Ormond Street Hospital and joking aside – I joked about those rotten, little sick kids ruining my idea! – I didn’t want to be the one stealing royalties from these kids so we couldn’t use Peter Pan. Although he was public domain here in the US, he wasn’t yet in place we wanted to sell the series to, so we had to switch them out. I still liked the idea of The Ultimate Villain being looked upon as one of the good guys in Fairytales and they had to be one that everyone knows, but because we had already launched Fables by then and getting it underway, that list of characters was pretty short. We were already using everyone that we had planned to. It was a matter of mentally going down that list and seeing a) who was still available and then b) who would make the most logical Dark Lord. The moment I picked Gepetto from that mental list, I saw in my mind this image of him carving soldiers from this magic grove of wood. I just had an image in my mind of an army of these guys marching down the streets in Fabletown, getting blasted away as they advance, but picking up spare parts from the fallen to repair themselves. This was during the very first round – of many – attempts at a Fables movie. I just couldn’t get that image out of my mind. No flesh army can do that. It turned out to be a stronger idea that Peter Pan, I think. I can see how a literal puppet-master can, by trying to do the right decision at the time, ultimately become an evil emperor. You’ve parodied many genres throughout the series – what was the most satisfying? The story of Bigby’s adventures in World War II was one of the most researched stories that we have done, for sure. I wanted it set in Frankenstein’s castle and when I was in the Army in Germany, I was stationed at the Frankenstein castle and was amazed how dilapidated it was allowed to get. I think it was because the Frankenstein story is simply not that popular in Germany. Things like Halloween was just not a big deal over there, so there wasn’t the cache of the spooky Frankenstein castle! However, they have since restored it. At the time, all the castles in Germany could be rented, so as to help pay for the upkeep, for weekends and parties etc. Of the big ones, the restored ones, which you could rent out for weddings and the like, were incredibly expensive. People in the military or the middle classes could never afford it. Because the Frankestein castle was just a ruin – like one tower and a few walls were all that was left – you could rent that for a song, so it was a popular place for people to go and spend a weekend. There were no facilities, you sleep in sleeping bags, there was nothing, but you were in The Frankesnstein Castle, for God’s sake! When I wanted to use that for the WWII story, I did a lot of research, finding out where Mary Shelley probably saw the castle on one of her trips through Germany and plucking that out as a good name for my protagonist. Also, there was this serendipitous thing where it turns out there was, in the nearby town, a secret underground tunnel which ran from the town in to the Frankenstein castle! It started with me thinking is there any way I can do a Wolfman versus Frankenstein, Universal Studios-style monsters story and then, the commando group were mix and match, patchwork versions of all the people I served with in the army. The series can be tremendously violent – was it important to evoke that often-overlooked aspect of the original stories? I think so. I certainly don’t have a yearning for lots of on-screen gore – things like Friday 13th do not appeal to me. However, as terrible consequence of a good story, then yes, absolutely. Part of the promise of Fables was to bring back the grim nature – no pun intended – of the original stories. They were macabre! You know, ‘Dad was a meanie, so we’re going to kill him, cut him up and serve him to his own family as a lesson’! Well, that’s a little OTT even for me! Speaking of violence, Boy Blue’s incursion into The Homelands where he used the Vorpal Sword to slay Imperial forces left and right was distinguished by that marvellous “SNICKER-SNAKT” sound-effect! That sound effect is actually in the original Jabberwocky song in Through The Looking-Glass where that poem appears. It’s just a short poem and part of it is that when you encounter the Jabberwock, you have your Vorpal Sword and you can slice the beast’s head off. In the midst of this wonderful jumble of the English language, which has more made up words every line than I think anyone has ever done, put in “SNICKER-SNAKT!” as the sound of the Vorpal Sword – which cannot be improved upon! You HAVE to say it out loud! You have an excellent collaboration with artist Mark Buckingham – What makes him the ideal core artist for Fables? Well, he has built his own job there! I have been in this business long enough to see that one of the handicaps of starting a new ongoing series was that it’s hard to keep an artist on a long-term basis. Artists, like writers, like to do many, many things and writers can do those projects because even thought the work might be just as emotionally-intense, it’s not as time-intensive. I can work on Fables and other things, artists have to work on what they’re doing at any given moment. As a result, they tend to come and go. So, my intention was to have a different artist do each story arc. 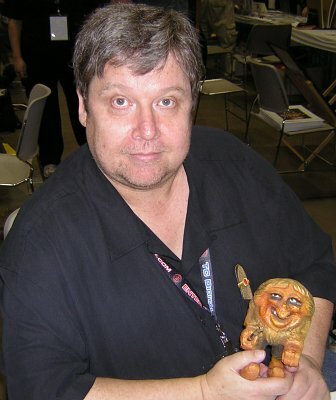 When Mark was brought in early on, it was a no-brainer; I had worked with him of the Merv Pumpkinhead special which was delightful. I said of course he needs to be one of our first guys. I think he was the one who said that he wants to be one of the first guys, but I also want to be the second and the third and fourth etc. He wants it as a regular gig, which surprised me and I didn’t think anyone would want this long-term. I am so happy he offered to stay. If I could adopt him and force him to work on Fables for the rest of his life, I would! Luckily, he seems inclined and loves the book as much as I do! Does “Bucky” have story input in to Fables various arcs? You’ve also generated an superb array of guest artists to do the fill-in stories – are these people beating your door down to be involved? How vital were James Jean’s painted covers towards establishing the series identity? Oh, I think that was the other secret in our favour: James Jean is the one living example of the overnight success story. The day after he graduated from art school, he came up to the Vertigo offices looking for work. Shelley saw his portfolio and was impressed enough. We were just starting our search for the cover artist. Shelley and I didn’t agree on everyone that was on the list, but it both agreed that it should be someone whose work doesn’t look anything like what’s on the stands today. He walked in and wowed her. She pointed me to his website and it absolutely wowed me too. I’m not sure he got the job while he was still in the office, but it must have been no more than one hour later. He walked out with the gig. The spontaneity of those covers is vital to us. I guess… I have admitted this before, but I never liked it! I’m not sure who designed it. I designed what I thought would be a good logo and DC hated it and said we have to get a real graphic designer to do it. So, maybe there was some resentment there! It’s grown on me and I don’t think it really took off until James started doing clever things with it. He took something that I thought was graphically funky and, first by putting the circle round it, found so many fun things to do with it. It won me over, because he did. He totally designed those covers beyond the art. He intergrated all aspects of the cover in to the story he was telling with the single image. 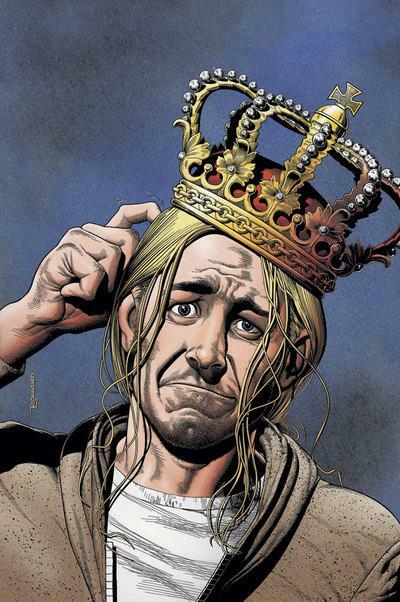 The series had a great spin-off in Jack of Fables, a character who is just an unrepentant – but utterly charming – swine: what do you enjoy about the character? Exactly that. I don’t want to be him, I don’t think I would want to spend time with him if he were real. Part of the escapism of our stories is that we can briefly inhabit the lives of people that we would not even consider knowing! Certainly, it’s arguable that a couple of the best movies ever made – The Godfathers – they are wonderful, but very few people who think they are wonderful and would watch them time and again would think “That’s probably a good lifestyle! Le’s start whacking our rivals! Etc” – so, yes, we love doing Jack, Matt and I, and he was certainly the poster child of the “Dare We Do”-school of writing. We would get ideas in our heads that we were fearful of going too far and Jack is all about “Why Not??”. He’s not a pleasant person and has a rogue’s charm sometimes, but always to the point where he’s completely self-serving – and not long-term, planned self-serving, but the Robber Baron of old that planned an empire, but created jobs for thousands etc. Jack is the epitome of the immediate self-serving who damns the consequces – which are always terrible consequences – but he never learns. With Jack of Fables now finished, will the characters be integrated back in to the core Fables series? The official word is that any character who survives the end of Jack of Fables is welcome back in to the main series if we can come up with an interesting story for them, so the answer is a qualified yes! There’s also Cinderella’s adventures which beautifully parody the spy genre: what are the plans for those? Chris Roberson, who does such a wonderful job with it, as long as he keeps offering story ideas, then we’ll keep doing it. If there’s always a new Cindarella min-series in production, then we mustn’t use her too much in Fables, so the character is available for them. So, we keep pushing her role in the main series back. I imagine there will be a time when we’d do another Cindy story in the main book, when I can steal her back! What’s the current state of the Fables TV series? At the moment, it’s gone again. It was going to be a movie, two or three times, I think, it was going to be a TV series on considerable occasions now and, each time, a pilot script was produced each time. I don’t want to be dismissive of those writers, but I read those scripts and while they were good stories, they just weren’t “FABLES” enough. They didn’t feel like there was an effort to translate what we were doing in the comic. It perplexed me, as I thought why don’t you just use those characters in the way you want to instead. So, I was not happy with that – but don’t assume that I had much say in the matter. Part of DC’s deal is that, early on, they purchase from me my share of the rights for the TV and movie adaptations, so they can have it done with a single voice and not have me being one of the voices carping in and saying “I want it this way!”. I am glad they didn’t happen, as I would like to see a TV or movie series done in a way that’s more faithful to the book. I had an invitation from the head of Warner Enertainment, at some point when he visited DC, invited me to put in to an e-mail memo what I think a Fables movie should be. He was adamant it could be a feature not a TV show. I did and I haven’t heard back yet, even that they received said mail. What I said was that I was too intimidated early on to write a Fables movie script as I thought the pros know better than I do. Now, having seen the pro’s take a shot at it twice and missed wonderfully, I am now of the opinion that I am the better choice to write it. 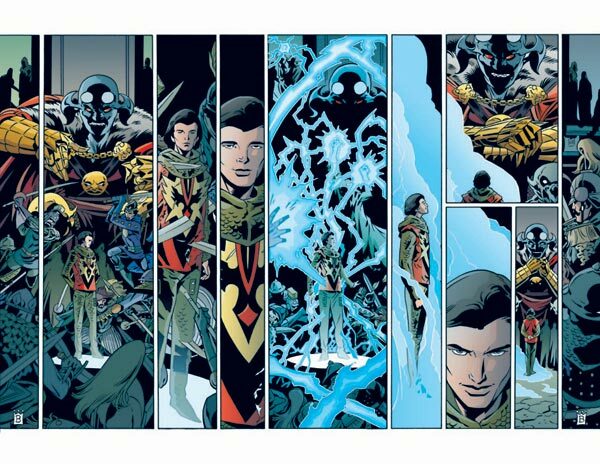 With the current arc, Super Group, you’re finally embracing the realm of superheroes – do you feel that superheroes are modern fables? Yes and no. I think we’ve become too sophisticated as readers to believe these stories. My understanding of the fairy tales in their earliest form, on some level at least, they were told to be believed. I don’t think we’ll ever look back and think that at some point in our past, Superman and Batman really existed. As mythology and folkore, as things that were important to us as a culture, then absolutely. I think that superheroes are now embraced as a reasonable form of literature and the fact that it’s embraced so much by cinema is testament to that. This is part of our cultural folklore – for better or worse. The forthcoming OGN, Werewolves of The Heartland, sees Bigby searching for a new location for Fabletown – will they be settling in your hometown of Minnesota? A little bit! Actually, I’ll give you a scoop: when I was living in Las Vegas, for reasons that continue to confound me, moving to my new home in Minnesota, I drove through Iowa, past a town called “Story City”. That was just too much! It turned out to be this wonderful small town and it was not named because it was a place of storytelling, which I found out when I said to the waitress “I know you want to take my order, but don’t you want to tell me a story?” and she said she’s never been asked that, which broke my heart! Then I found out later on that it was named after a famous Federal Judge. However, they do have one storytelling festival every year. I made my decision then and there that somehow, I would have to set a story in Story City and that’s where Werewolves of The Heartland was born. So, I have not told anyone else this! 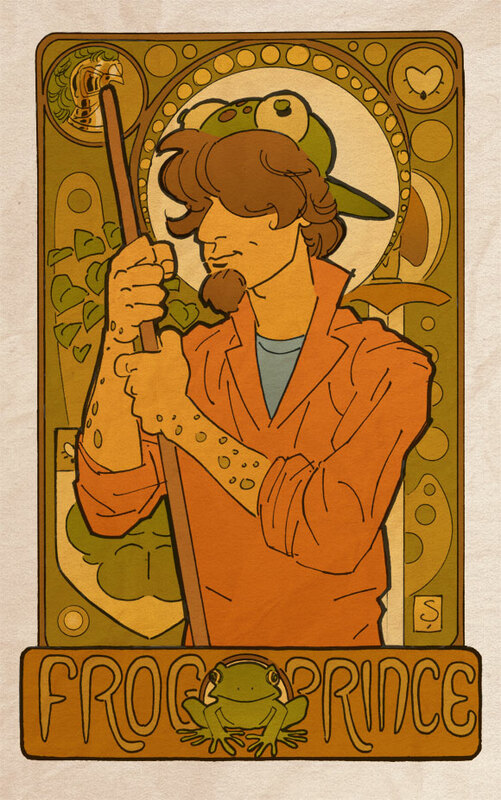 What do you see as the core of Fables’ enduring appeal? Fables genuinely feels like it can run and run – but do you have a climax in mind? Volumes 1-16 of FABLES, Volumes 1-9 of JACK OF FABLES, Cinderella: FROM FABLETOWN WITH LOVE, PETER &MAX: A Fables Novel and FABLES: Covers By James Jean are all available in the UK from TITAN BOOKS and in the USA by DC Comics/Vertigo.